Activists demonstrated outside the Tel Aviv offices of the Haaretz newspaper over column which encouraged terrorist rock-throwing attacks. Activists from the Petah Tikva headquarters of the Samaria (Shomron) and Binyamin Residents' Councils demonstrated on Sunday outside the Tel Aviv offices of the Haaretz newspaper. Later in the column Hass termed rock-throwing “a metaphor for resistance.” Hass is the official Haaretz correspondent for what the newspaper labels the "occupied territories". The demonstrators on Sunday evening said, "We came to clarify to Haaretz editor Aluf Benn and to Amira Hass, who wrote the article inciting to rock-throwing at Jewish residents of Judea and Samaria, that rock-throwing can kill." 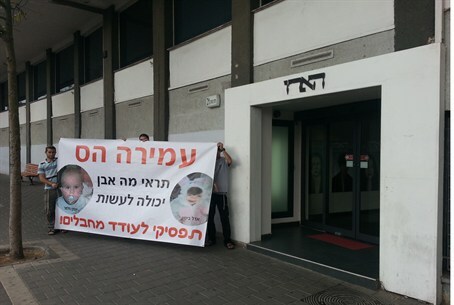 The activists hung a huge banner near the newspaper’s office, on which there were photos of baby Yonatan Palmer, who was killed along with his father when terrorists threw a rock at their vehicle near Hevron, and of three-year-old Adelle Biton, who was critically injured several weeks ago by a rock that was thrown at the car in which she was riding next to Ariel. Adelle has been fighting for her life at the Schneider Hospital in Petah Tikva ever since. Along with the pictures of the two infants, the banner read: "Amira Hass, look what a rock can do. Stop encouraging terrorists!" Last week, Adelle’s mother Adva Biton wrote a response letter to Hass in which she invited the leftist writer to come to see her daughter at the hospital and see for herself what rock-throwing can do. Katzover called on the police and the Attorney General to treat Hass’s article very seriously and put her on trial for incitement to murder. The Legal Forum for the Land of Israel has contacted Attorney General Yehuda Weinstein, asking that he launch an investigation against Hass on suspicion of incitement. Attorney Hila Cohen, writing on behalf of the Legal Forum, wrote in the letter to Weinstein that Hass’s comments were serious and constitute an incitement to violence and terrorism, while encouraging murderous terrorism. The demonstrators were strengthened by both passersby as well Haaretz employees who entered and exited the building. Some of the Haaretz employees even told the protesters that Amira Hass does not represent them.